EasyTurf is scheduled to showcase their industry leading, environmentally friendly synthetic turf at the Greenbuild International Expo Oct. 22, 23 In New Orleans. EasyTurf will unveil a booth that showcases the intricate energy saving and water conscious systems associated with their fastest growing artificial grass applications, pet, rooftop, playground and commercial landscapes. EasyTurf will unveil a booth that showcases the intricate energy saving and water conscious systems associated with their fastest growing artificial grass applications, pet, rooftop, playground and commercial landscapes. The EasyTurf artificial grass system can be largely engineered with recycled products, adding to the environmentally friendly nature of synthetic turf. Advancements in synthetic turf technology have increased the list of applications available to consumers. Lawns and putting greens are now just a fraction of EasyTurf's installations. The green roof industry has been growing aggressively since 2009, up about 115 percent thanks to companies and organizations like Green Roofs for Healthy Cities (GRHC), Cities Alive, EasyTurf, and the more than 425 accredited Green Roof Professionals (GRPs) in the market. EasyTurf is one of the most effective water conservation products available to green building industry professionals. EasyTurf is 100 percent recyclable, reduces carbon emissions, utilizes waste and preserves precious water resources. More than 30,000 attendees and 900 exhibiters from across the U.S. and around the world are expected to gather at the Morial Convention Center. For more information, visit http://www.greenbuildexpo.com. 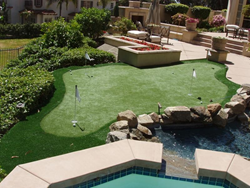 In May 2010, EasyTurf, Inc., a long-time distributor of the FieldTurf line of landscaping products and a recognized leader in the artificial grass industry, became the national brand of FieldTurf landscape, pets, playground, and golf artificial grass products. The partnership allowed FieldTurf to rapidly expand its existing dealer network and accelerate sales and distribution of FieldTurf landscape products on a national level to homeowners, municipalities, schools, businesses and the military.